Printronix T4M provides uncompromised performance and features with the same PSA3TM advanced electronic architecture found in the high performance T5000r. Install the T4M seamlessly into other printer brand environments using the widest breadth of embedded printer protocol interpreters. The T4M maximizes productivity and offers flexibility to grow with changing requirements. PrintNet Enterprise Remote Printer Management SoftwareThe SL4M and T4M printers provide 802.11b/g wireless Ethernet connectivity when installed with a wireless Ethernet. The wireless option comes standard with the powerful remote printer management tool, PrintNet Enterprise. 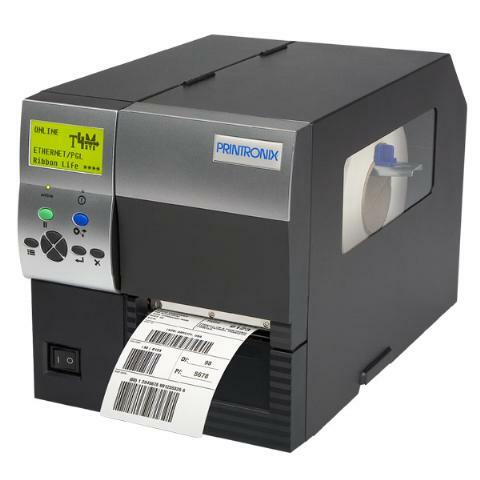 For application specific time sensitive requirements without continuous host/time synchronization with "time-at-print" capabilities such as production, expiration, and lot code dates and times. Increased Flash to store autoexec files, logos, graphics, fonts and support larger, longer, and more complex label formats. For applications that require DBCS for local and regional printing. Character sets supported include Hangul, Hanzi GB, and Kanji SJIS.